Mediated discussion may be next step for Keiro and anti-sale protesters. After more than four months of protest, the Ad Hoc Committee to Save Keiro has finally had a chance to speak directly with Attorney General Kamala Harris about the pending sale of Keiro Senior HealthCare’s facilities. Charles Igawa, one of the co-chairs of the Ad Hoc Committee, said that he received a call from Harris on the afternoon of Tuesday, Jan. 12. The call was facilitated by Rep. Maxine Waters (D-Gardena) and her staff, who have been publicly supporting the Ad Hoc Committee since November. Reporters and members of the public ask questions about the pending Keiro sale at Thursday’s press conference. Although Harris said that she cannot legally reverse her decision to allow Keiro to sell its facilities to Pacifica companies, she mentioned that her office could mediate a discussion among the Ad Hoc Committee, Keiro and Pacifica. The discussion period could be lengthened if necessary, which might lead to a postponement of the close of escrow. Igawa said that he was careful during the phone conversation not to agree to anything on behalf of the committee. Among his group, members remain split: some welcome the idea of a conversation with Keiro, while others are not willing to consider alternatives other than stopping the sale. Igawa expects the committee to discuss its official response to Harris at its next meeting this Saturday. 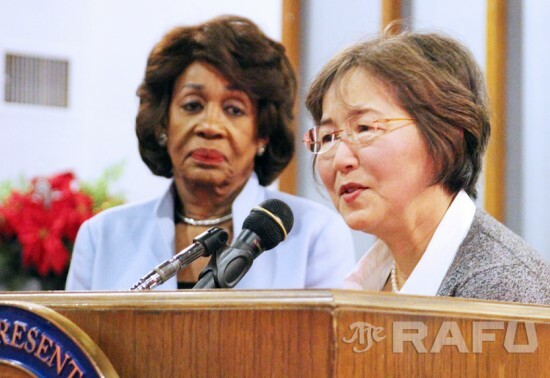 The Ad Hoc Committee has also made progress in other ways, in part thanks to Congresswomen Maxine Waters and Judy Chu. It presented these new developments at a press conference on Thursday in Gardena, co-hosted by the two congresswomen. First of all, the group is no longer technically an “ad hoc committee” but an officially incorporated nonprofit. They have also begun working with law firms Bet Tzedek, Legal Aid Foundation of Los Angeles, and Gibson Dunn and Crutcher, along with advocacy group the California Advocates for Nursing Home Reform. Elissa Barrett, Vice President of Bet Tzedek, is leading the law groups to investigate the Ad Hoc Committee’s options to stop or postpone the sale. She feels that the ideal next step would be a face-to-face discussion with representatives from the committee, Keiro, and Pacifica. 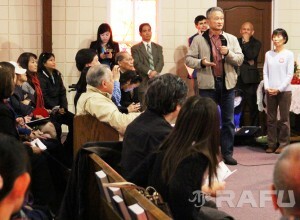 The Ad Hoc Committee will hold its next public forum at Centenary United Methodist Church in Little Tokyo on January 23 at 1 pm. For more information about the meeting, visit savekeiro.org.